National Chairman of the party, Comrade Adams Oshiomhole has ruled out offering automatic return tickets to members of the ruling party in the National Assembly. Oshiomhole made the position of the party known at a meeting with members of the APC Caucus in the House of Representatives who visited him at the party’s secretariat, Abuja yesterday. At the meeting with the Caucus of the APC leadership, demanded automatic return tickets as a reward for keeping faith with the party and stemming the tide of defections ahead of the 2019 general elections. Hon. Femi Gbajabiamila, who led his colleagues to the meeting, argued that the current wave of defections rocking the APC was not without inducements by forces in the opposition camp. He alleged that prior to last Tuesday’s defections, mouth-watering offers were made to the APC members in the lower chamber of the National Assembly. 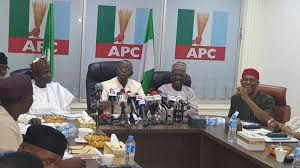 According to Gbajabiamila, those poaching APC members were still making the offers to lure away more members of the ruling party, adding that the party should consolidate on its members by considering offering them automatic tickets in order to retain them in the parliament. “I personally consider it an abysmal failure the attempt to turn APC into a minority party in the House and Senate. The reason why that was not possible is because, and I cannot stress that enough, seated before you are very convinced members who are committed to the ideals of our party despite sharing in the grievances of those who have left, remain steadfast. “It is a time to consolidate and make sure we stay in touch with our members and keep them close, continue to appreciate them, continue to fight for these members. A lot of them are first timers, that only is a case to make. “If you want this country to progress, we can’t continue to turn members around. First timers who have acquired experience to become ranking members and have represented the party at the grassroots level, should be taken into serious consideration and I think they deserve a second term. “Because if they don’t come back, we are going to lose the first six month to one year training the fresher. How does that help the party? How does that help the country?” Gbajabiamila asked. In his reaction, Oshiomhole said that the party would consider experience, but more importantly, the value that the individual lawmaker brings to the table in considering who gets the ticket of the party. Oshiomhole, gave no definite commitment to the lawmakers, expressed delight that many of them were able to resist the temptation of the poachers. “I am excited that even in moments like this; we still have men and women of honour in the House of Representatives who recognize that there are values more important than dangling automatic tickets, dangling dollars without asking questions about the source of those dollars. “But I can assure you that if people have not learnt from the recent past, then they will go the way of the recent past. We must remain focused and I am grateful that we still have men and women of honour who have refused to be tempted. “Somebody asked if we are going to counter the PDP by offering automatic ticket and I asked, did we serve anybody a departure ticket? If we did not give you a departure ticket, how did the issue of return ticket arise? For me, we are clear that every legislator who has value and is at home with his people and not with the godfathers in their communities, that legislator is an asset to our party and this party will do everything possible to retain them. “It can’t be argued that experience should be discarded because in the real world, nobody can give what he does not have and experience is not learnt from the book, but acquired on the job where honest mistakes are made and intelligent and honest people can identify those mistakes, overcome them and move on. “I understand now, after we have carried out some investigations that certain persons played on the fears of people who were completely innocent. They tried to portray their own frustration which is personal to them as if it is a shared frustration by all those who have issues. “My own finding arising from interactions is that it is true that there are a number of legislators who have some issues with their local forces in their respective states and not arising from the federal executives. Those issues are local and because every politics is local, every solution to political problem should necessarily be local. “The important thing is to identify the source of those problems, the parties involved in it, bring to the table and remind them of what bind the house together,” Oshiomhole said. The meeting was attended by over 50 members of the House, but Speaker Yakubu Dogara and his deputy, Yusuf Lasun, were conspicuously absent. Gbajabiamila said that both of them were informed of the meeting. He, however, explained that their absence from the meeting could be because of other engagements.